Difference between revisions of "Elliptic Curve Cryptography"
The OpenSSL EC library provides support for Elliptic Curve Cryptography (ECC). It is the basis for the OpenSSL implementation of the Elliptic Curve Digital Signature Algorithm (ECDSA) and Elliptic Curve Diffie-Hellman (ECDH). Note: This page provides an overview of what ECC is. It also describes the low-level API for working with Elliptic Curves. If all you need is support for normal ECDSA and ECDH operations then you should normally use the high level EVP API. Refer to [[EVP]] for a description of the EVP API. Refer to [[EVP Signing and Verifying]] for how to perform digital signature operations (including using ECDSA), [[EVP Key Derivation]] for how to derive shared secrets using DH and ECDH, and [[EVP Key and Parameter Generation]] for details of how to create EC Keys. The primary advantage of using Elliptic Curve based cryptography is reduced key size and hence speed. Elliptic curve based algorithms use significantly smaller key sizes than their non elliptic curve equivalents. The difference in equivalent key sizes increases dramatically as the key sizes increase. The approximate equivalence in security strength for symmetric algorithms compared to standard asymmetric algorithms and elliptic curve algorithms is shown in the table below. As can be seen, to get equivalent strength to a 256 bit symmetric key, a standard asymmetric algorithm would have to use an enormous key of 15360 bits. Keys of this size are typically not practical due to the amount of processing power that would be required, and therefore the speed of the operations. However, with elliptic curve algorithms, the equivalent key length is 512 bits, which is entirely practical. A finite field is simply a field where the set has a finite number of elements. So, for example, the set of all integers could not be used as the basis for a finite field because there are an infinite number of them. However the set of integers from 1 to 100 could form the basis of a finite field. A finite field is simply a field where the set has a finite number of elements. So, for example, the set of all integers could not be used as the basis for a finite field because there are an infinite number of them. However the set of integers from 0 to 100 could form the basis of a finite field. In Elliptic Curve Cryptography we further restrict this such that x, y, a, b and c are elements of a '''finite''' field. In Elliptic Curve Cryptography we further restrict this such that x, y, a and b are elements of a '''finite''' field. Contrary to its name Elliptic Curves do not form an ellipse! Ok, so far so good - but now it gets a bit more complicated! As well as the points on our curve we add an additional "special" point known as infinity. Using this set of points (i.e. all the points on the curve and infinity), we can define some operations on this set, which we call Point Addition and Point Multiplication. This actually gives us a new mathematical structure called a group. Ok, so far so good - but now it gets a bit more complicated! As well as the points on our curve we add an additional "special" point known as infinity. Using this set of points (i.e. all the points on the curve and infinity), we can define some operations on this set, which we call Point Addition and Point Multiplication. Points on a curve are given in terms of their x and y co-ordinates, (x, y). Point Addition is essentially an operation which takes any two given points on a curve and yields a third point which is also on the curve. The maths behind this gets a bit complicated but think of it in these terms. Plot two points on an elliptic curve. Now draw a straight line which goes through both points. That line will intersect the curve at some third point. That third point is the result of the addition operation. Point Doubling is similar and can be thought of as adding a point to itself. Imagine a point on the curve and draw a straight line which is a tangent to the curve at that point. The result of the Point Doubling operation is where that tangent line intersects the curve at some other point. Point multiplication is the operation of taking a point on the curve and "multiplying" it by some number. In practice this is achieved through repeated addition and doubling operations. So with our group of points on a curve we can start doing some useful. First of all we pick a point on the curve called the generator (we'll call it g). So with our set of points on a curve (plus the special point, infinity) we can start doing something useful. First of all we pick a point on the curve called the '''generator''' (we'll call it g). Remember g, 2g and 3g are all points on the curve, and '''+''' in this context means point addition as defined above. If you keep going in this way you will eventually come to some number (lets call it '''n'''), such that ng = infinity. The set of points generated by repeatedly adding g to itself, along with the Point Addition operation together form a mathematical structure known as a '''group'''. If you are lucky then you may have chosen a curve and a g, such that continually adding g to itself will eventually visit all of the possible points on the curve - but often this is not the case. The number '''n''' as defined above, is called the '''order''' of g. For various complicated mathematical reasons it also turns out that the total number of points that exist on the curve is divisble by n. Dividing the total number of points by n gives you another number known as the cofactor. The security of Elliptic Curve Cryptography comes from the fact that given some point on the curve kg, (where k is a number and g is the known generator point), it is difficult to work out what the value of '''k''' is. This is known as the '''discrete logarithm problem'''. In the Elliptic Curve Cryptography algorithms ECDH and ECDSA, the point kg would be a public key, and the number k would be the private key. In principle there are many different types of field that could be used for the values x and y of a point (x, y). In practice however there are two primary ones used, and these are the two that are supported by the OpenSSL EC library. Note then that addition is just a simple XOR operation. Multiplication in the binary field is done respective to an '''irreducible polynomial'''. Multiplication of polynomials is done in the normal way and the result is then divided by the irreducible polynomial. The remainder is the result of the multiplication. See http://en.wikipedia.org/wiki/Finite_field_arithmetic, for a discussion of binary field arithmetic. The parameters necessary for performing cryptographic operations for ECDH and ECDSA are simply the parameters required to set up the curve. Namely: the type of field e.g. prime (F<sub>p</sub>) or binary (F<sub>2<sup>m</sup></sub>), the value p for a prime field, the irreducible polynomial for a binary field, the values a and b from the curve equation, the generator point (g), the order and the cofactor. Fortunately unless you are defining a new curve (not recommended unless you know what you are doing), or you are using an unusual curve that OpenSSL does not have support for, you can usually utilise one of the '''named''' curves that are built-in to OpenSSL. These are a set of well known and widely used curves. The complete collection of curve parameters can be set in one go simply by selecting the appropriate named curve using [[Manual:EC_GROUP_new(3)|EC_GROUP_new_by_curve_name]]. Keys for ECDH and ECDSA are represented using an [[Manual:EC_KEY_new(3)|EC_KEY]] structure in the low level [[Manual:Ec(3)|EC]] API. If you are using the preferred high-level [[EVP]] API then this EC_KEY structure will be wrapped in an [[EVP#EVP Working with EVP_PKEYs|EVP_PKEY]] object. If you want to save a key and later load it with <tt>SSL_CTX_use_PrivateKey_file</tt>, then you '''must''' set the <tt>OPENSSL_EC_NAMED_CURVE</tt> flag on the key. You do that by calling <tt>EC_KEY_set_asn1_flag(ecKey, OPENSSL_EC_NAMED_CURVE)</tt>. Failure to do so will result in a SSL error of 0x1408a0c1 (no shared cipher) at the server. 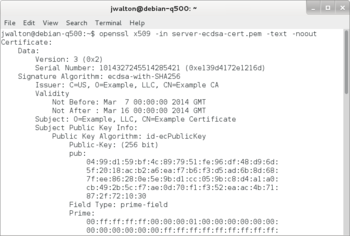 The certificates below were dumped with <tt>openssl x509 -in server-ecdsa-cert.pem -text -noout</tt>. The certificate on the left was created with a key using <tt>OPENSSL_EC_NAMED_CURVE</tt>, while the certificate on the right was not. Notice the certificate on the left includes '''ASN1 OID: prime256v1'''. The certificate on the left can be used with SSL server using ECDSA, but the certificate on the right cannot because it will result in 0x1408a0c1 at the server. Note that OpenSSL's <tt>X509_verify</tt>, <tt>X509_verify_cert</tt>, <tt>SSL_CTX_check_private_key</tt>, <tt>SSL_CTX_use_PrivateKey_file</tt>, and <tt>SSL_CTX_use_certificate_chain_file</tt> will not return a failure when using a key or certificate in the wrong format. Remember g, g&sup2; and g&sup3; are all points on the curve, and '''+''' in this context means point addition. The security of Elliptic Curve Cryptography comes from the fact that given some point on the curve g<sup>x</sup>, and knowing g, it is difficult to work out what the value of '''x''' is. This is known as the '''discrete logarithm problem'''. Note: This page provides an overview of what ECC is. It also describes the low-level API for working with Elliptic Curves. If all you need is support for normal ECDSA and ECDH operations then you should normally use the high level EVP API. Refer to EVP for a description of the EVP API. Refer to EVP Signing and Verifying for how to perform digital signature operations (including using ECDSA), EVP Key Derivation for how to derive shared secrets using DH and ECDH, and EVP Key and Parameter Generation for details of how to create EC Keys. 1 Why use Elliptic Curves? 2 What is an Elliptic Curve? What is an Elliptic Curve? There must be additive and multiplicative inverses for all elements in the set. So, for example, for every element a in the set there is also a -a so that a + (-a) = 0 (where 0 is the identity element for addition). Similarly for multiplication. In Elliptic Curve Cryptography we further restrict this such that x, y, a and b are elements of a finite field. So with our set of points on a curve (plus the special point, infinity) we can start doing something useful. First of all we pick a point on the curve called the generator (we'll call it g). Remember g, 2g and 3g are all points on the curve, and + in this context means point addition as defined above. If you keep going in this way you will eventually come to some number (lets call it n), such that ng = infinity. The set of points generated by repeatedly adding g to itself, along with the Point Addition operation together form a mathematical structure known as a group. If you are lucky then you may have chosen a curve and a g, such that continually adding g to itself will eventually visit all of the possible points on the curve - but often this is not the case. The number n as defined above, is called the order of g. For various complicated mathematical reasons it also turns out that the total number of points that exist on the curve is divisble by n. Dividing the total number of points by n gives you another number known as the cofactor. The security of Elliptic Curve Cryptography comes from the fact that given some point on the curve kg, (where k is a number and g is the known generator point), it is difficult to work out what the value of k is. This is known as the discrete logarithm problem. In the Elliptic Curve Cryptography algorithms ECDH and ECDSA, the point kg would be a public key, and the number k would be the private key. Multiplication in the binary field is done respective to an irreducible polynomial. Multiplication of polynomials is done in the normal way and the result is then divided by the irreducible polynomial. The remainder is the result of the multiplication. See http://en.wikipedia.org/wiki/Finite_field_arithmetic, for a discussion of binary field arithmetic. The parameters necessary for performing cryptographic operations for ECDH and ECDSA are simply the parameters required to set up the curve. Namely: the type of field e.g. prime (Fp) or binary (F2m), the value p for a prime field, the irreducible polynomial for a binary field, the values a and b from the curve equation, the generator point (g), the order and the cofactor. Fortunately unless you are defining a new curve (not recommended unless you know what you are doing), or you are using an unusual curve that OpenSSL does not have support for, you can usually utilise one of the named curves that are built-in to OpenSSL. These are a set of well known and widely used curves. The complete collection of curve parameters can be set in one go simply by selecting the appropriate named curve using EC_GROUP_new_by_curve_name. Keys for ECDH and ECDSA are represented using an EC_KEY structure in the low level EC API. If you are using the preferred high-level EVP API then this EC_KEY structure will be wrapped in an EVP_PKEY object. If you want to save a key and later load it with SSL_CTX_use_PrivateKey_file, then you must set the OPENSSL_EC_NAMED_CURVE flag on the key. You do that by calling EC_KEY_set_asn1_flag(ecKey, OPENSSL_EC_NAMED_CURVE). Failure to do so will result in a SSL error of 0x1408a0c1 (no shared cipher) at the server. 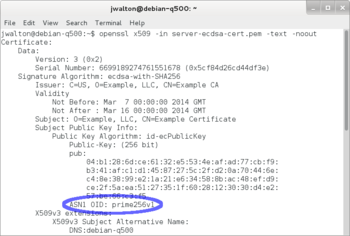 The certificates below were dumped with openssl x509 -in server-ecdsa-cert.pem -text -noout. The certificate on the left was created with a key using OPENSSL_EC_NAMED_CURVE, while the certificate on the right was not. Notice the certificate on the left includes ASN1 OID: prime256v1. The certificate on the left can be used with SSL server using ECDSA, but the certificate on the right cannot because it will result in 0x1408a0c1 at the server. Note that OpenSSL's X509_verify, X509_verify_cert, SSL_CTX_check_private_key, SSL_CTX_use_PrivateKey_file, and SSL_CTX_use_certificate_chain_file will not return a failure when using a key or certificate in the wrong format. This page was last modified on 11 April 2016, at 20:12.